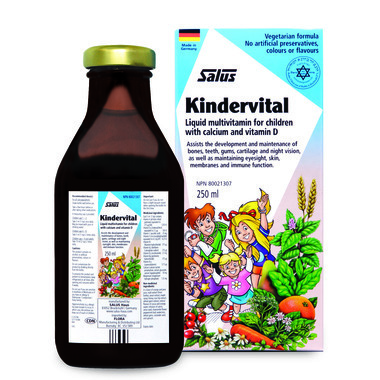 A pleasant tasting liquid supplement for children, Kindervital is a unique, balanced herbal tonic that supplies bone- and tissue-building vitamins and minerals such as calcium and magnesium that are important for growing children. Kindervital helps the body with the absorption and use of calcium, which is especially important for developing strong teeth and your child’s growing bones. Children 1-3 yrs: 5ml (1 tsp) once daily. Children 4-8yrs: 5 ml (1 tsp) 2 x daily. Children 9yrs+: 10ml (2 tsp) 2 x daily. This product contains no alcohol; or artificial preservatives, colours or flavours. Hypersensitivity (e.g. allergy) has been known to occur, in which case, discontinue use. Keep out of reach of children. Love this liquid form vitamin! My 2 yr old loves it (always wants more!) it has so much good stuff in it...after trying so many other multi-vitamin, I am happy to have found a one that is reasonably priced, that ships to Canada and that is not filled with sugar and preservatives! use this product with probiotics and your baby will be protected from daycare side effects . Plus my baby loves the taste. I like that this isn't full of sugars and actually tastes good. Great multi vitamin for the little ones. It is made in a base of orange and pear juice (not the artificial syrupy flavour, but real juice). I like that it doesn't have any iron in it. People might complain that it doesn't have any iron, but think about it, anemic children are already taking iron supplements (like ferramax). Too much iron is also detrimental for health. Also, this product contains calcium, and iron and calcium compete with each other for absorption so it is never a good idea to combine the two as your body will only be able to absorb one or the other, not both effectively at the same time. There is a reason Doctors say never take iron with milk or other calcium rich beverage/food. My 2 year old is an extremely picky eater and this product is perfect for ensuring he doesn't miss important vitamins and minerals (he also takes a separate iron supplement at a different time to this multivitamin for better absorption and to avoid calcium and iron competition). We've been using this for 3 years with our son and he loves it! Our 1 year old daughter just started using it and loves it as well. Great taste - they always want more! We tried a few different liquid multi vitamins but my 15 month old son hated them all and would not drink it, He loves this stuff and always asks for more, its not really sweet and has an orange juice base. It doesn't contain iron but that doesn't bother me as I know he gets enough iron from his diet. Great product - definitely recommend it. Love this product and the kids like it too. My son really enjoys taking his vitamins. He even reminds me if I forget. taste like orange juice!